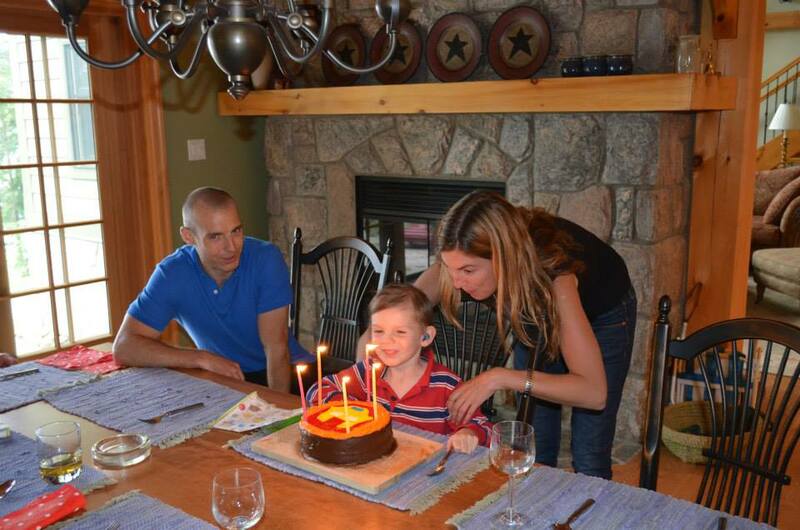 On Labour Day weekend, the Gavinator blew out 5 candles on his Iron Man birthday cake. 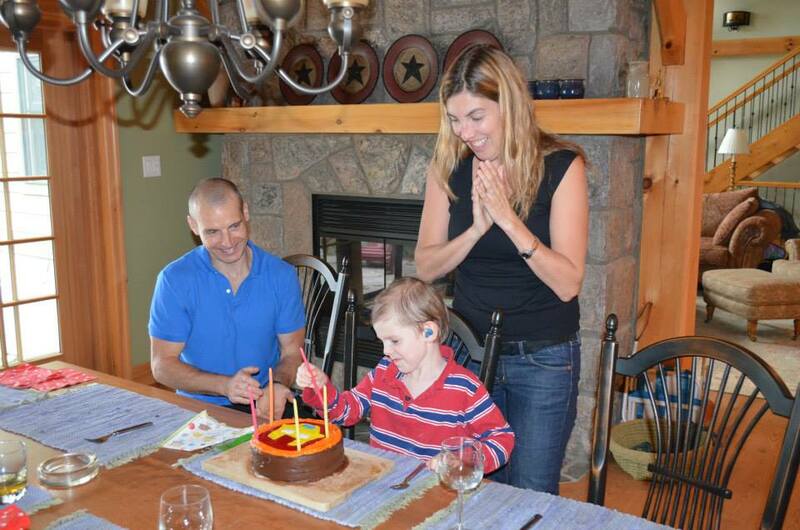 His wish was fulfilled to celebrate his special day together with the family at my parents’ cottage in Muskoka. In keeping with tradition, there were many presents to be opened and fun to be had in the water on the last weekend of summer. Emotions were running high after the failure of ICP monitoring and the immense stress Craig and I had been under after the previous few days in hospital. 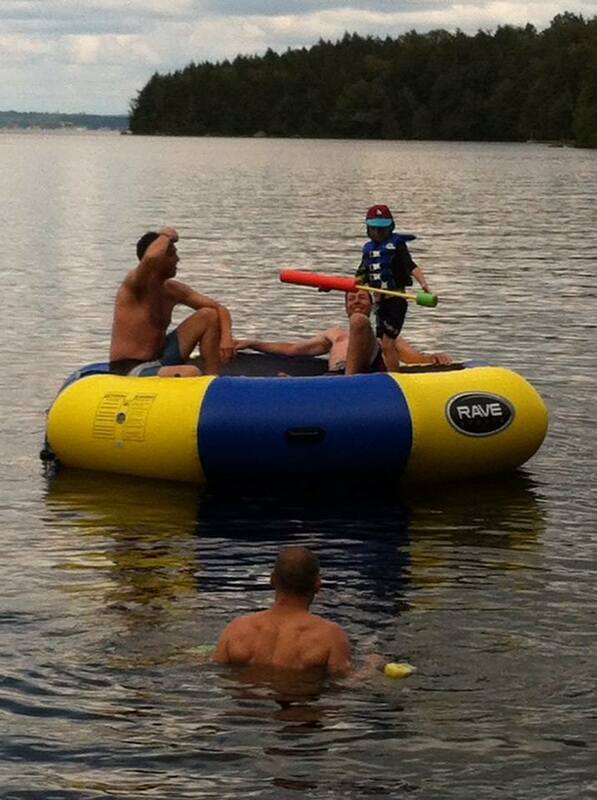 But Bean took the whole episode in stride and was only concerned that he wouldn’t be able to try out the “Bongo” – the new water trampoline that Bubby had recently acquired. So although he had a fresh incision that wasn’t supposed to get wet, we solved that problem by wrapping his head in plastic wrap and topping it off with a hat. Bongo time! The rest of September has blasted past, making it hard to believe that the first month of school is now over. My most fervent wish for September 3rd was that Gav would be able to attend school and celebrate his birthday and not be sick and enjoy all of it. The first day of school he was off with cookies to share with friends and his new “spy-scope” to show the kids in Show and Share. 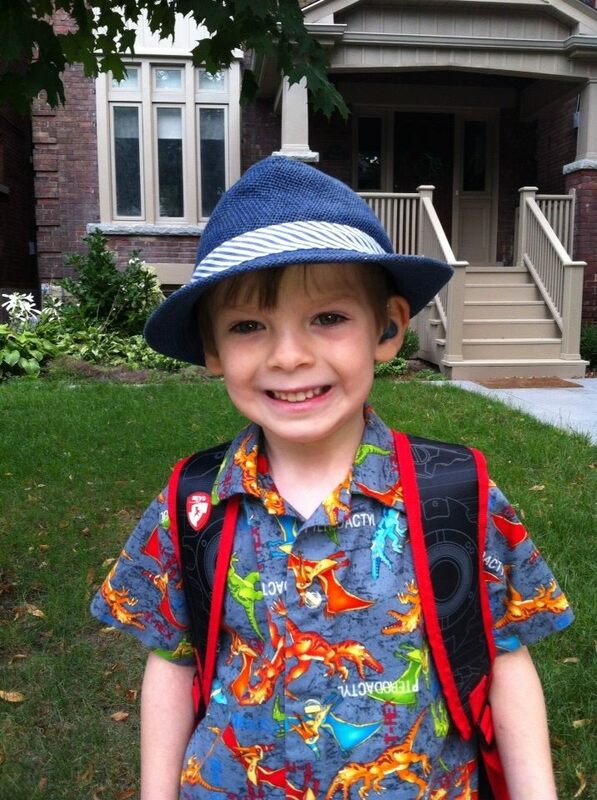 For a 5-year-old, having your birthday on the 1st day of school is completely awesome. Not only is he now a “senior”, he got to be the Person of the Day! The start of school this year was a bit chaotic due to the beginning of the Full Day Kindergarten program at Bean’s school, but the teachers took it all in stride and managed the arrival of 90 kindergarteners with grace. I am immensely thankful that Gavin has the same teacher as last year, a lovely woman whom I know has helped him thrive at school. She is completely aware of his health issues and concerns, and has helped to put together a plan should he suffer any of his bouts of nausea at school. I’ve given her a yoga mat which can be rolled out in a quiet corner if he needs it. My hope is that I won’t be collecting him from school every other day – if he has a little lie-down, the feeling may pass. On that note, it has been amazing that most of his episodes have occurred outside of school hours. We’ve had some in the early morning, which have dissipated at the very last minute, say 8:50, and have ended with me throwing Gav in the car and still making it to school on time. At other times, he’s felt sick in the evenings, still vomiting about once a week, but it is controlled with ondansetron and rest. Our absolute priority this year is to make sure that Gav misses as few days of school and activities as possible. He is still having “the yucky feeling” daily, which means he has to lie down/be carried/avoid food. The problem here is that he is missing about a meal a day, so in the between time I am trying to stuff as many calories as possible into him. We are managing. 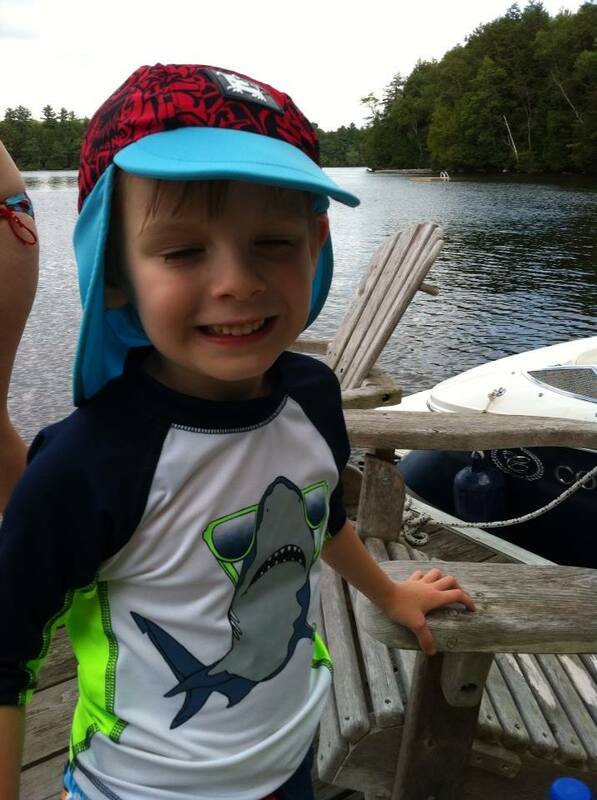 On Monday this week, Gavin had his regularly scheduled MRI of brain and spine. I didn’t have time to develop a huge bout of scanxiety, as the last scan was in August. Gav’s concern with MRI’s is that he still needs an IV to receive the contrast, and he really, really doesn’t want one. He may think that he is ready for it, and look as though he will soldier through, but when it comes down to it, it’s still very difficult for a little person to handle. It took some convincing to get him to hold out his arm for the poke, but we finally got there, after some tears and shouting. The next challenge was to lie still in the machine for well over an hour, but he super-starred it again. Once we were free and the IV out, he was satisfied with a cake pop and Batman balloon as consolation prizes, and I had him back at school by 11:00. Usually, after a scan, I have to wait for neuro-onc to contact me with the results, but this time around I knew that I would be seeing our neurosurgeon Dr. Dirks the next day. Although I was certain the scans were good, it was still fairly nerve-wracking to have the doctor review them while I was sitting there behind him. He quickly assured me that there was no sign of tumour growth, and that everything else looks good except for Gav’s ventricles, which are very, very small. Otherwise, our only option is to start playing around with his shunt. Right now that doesn’t feel like the best choice – it’s an invasive surgery and he is not currently in any danger. If we were seeing signs of high pressure, it would be a very different story. At the end of August, I couldn’t have predicted that we would get through September with Gav only missing about 2 days of school. I am so grateful. He is loving life! s fantastic news!! Enjoy the Autumn colours – If you are near Bracebridge sometime – send me a quick msg and perhaps we could have a quick visit. I would Love to meet your adorable son, Gavin! Hi Erica, I just got myself caught up on your last few posts. What a summer you’ve all had. It’s great to hear that Gavin’s settling in to school. It’s too bad that Georgia’s at Fern or maybe we’d see each other in the school yard! Hope to see you both soon. Sending love and hugs! Lovely photos of the birthday party, holiday and school. Glad to hear your good news and hope Gavin’s episodes of feeling yucky are over soon.